Get the ultimate peace of mind for a home or cabin that you are frequently away from during the day. This alarm system not only includes a loud siren to deter intruders but also will call you on the phone to let you know of a potential break-in. Never worry that your home or second home will have an unwanted intruder. 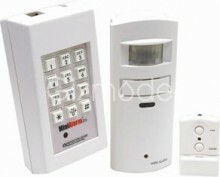 The alarm system will call every 15 minutes when motion is detected. There are no monthly burglar monitoring fees. Infrared beam detects movement up to 20 feet (6m) away. It works on an existing standard single telephone line. This model operates on a single 9-volt battery and four AA batteries. Click the button below to add the MiniAlarm Plus Motion Sensor with Call Out to your wish list.